Lloyd Binder’s reindeer. Photo from Canadian Reindeer. When Stina Cowan of the Nordic Heritage Museum asked if I would introduce the Sámi short films at SIFF’s 2014 Nordic Lights Film Festival, I didn’t hesitate. Two years ago, it was a SIFF screening of the documentary Suddenly Sámi that seeded the formation of Pacific Sámi Searvi and my personal journey of discovery. Since that time, there have been significant events for Sámi culture in our region, including a large duodji exhibit bringing artifacts and lecturers from the Ajtte Museum, the first local celebration of Sámi Day at Tacoma’s PLU, the first Sámi Grand Marshal and Sámi flag in Ballard’s Syttende Mai parade, the first “official” Sámi-American participation in Astoria’s Scandinavian Festival, and the first English translation of Emilie Demant-Hatt’s “With the Lapps in the High Mountains,” by local author and translator Barbara Sjoholm. Searvi members also rallied on behalf of Idle No More and Gallok. It was exciting enough to have four Sámi-related films at SIFF; I did not expect a personal connection. Imagine my surprise on learning that the reindeer in Tundra Cowboy are my DNA cousin Lloyd Binder’s. While I haven’t met him in person (FamilyTreeDNA linked us), he was kind enough to answer my questions when I contacted him online. Both Lloyd and his reindeer are descendants of the Yukon Relief Expedition of 1898, which brought Sámi herders and reindeer from Sápmi through Seattle up to Alaska. 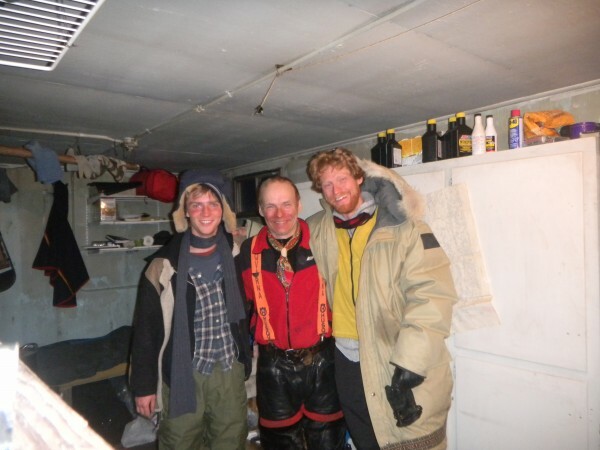 His maternal grandfather Mikkel Pulk joined the expedition in its second year, and in the 1930s, Mikkel and his wife Anna were recruited by the Canadian government to teach herding to the Inuits. The Pulks remained as herders for over 30 years. Their daughter Ellen, married Lloyd’s father, Otto, an Inuvialuit from Coppermine, N.W.T., now known as Kugluktuk (Otto also owned a herd for several years in the 1940s). 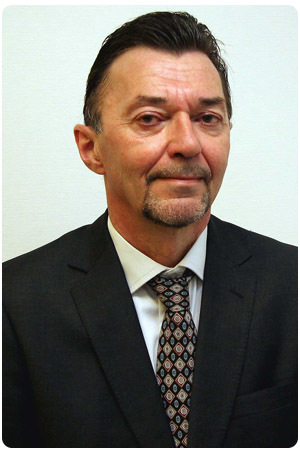 Lloyd earned an economics degree from the University of Calgary and served as director of economic development and tourism for the Inuvik region before turning to herding. It’s in his blood. It is possible that I am also related to Henrik, as he and my grandfather were both born in Pajala Municipality in northern Sweden. The Sámi gene pool is small, even though, like the offspring of the Yukon Relief Expedition, it is dispersed over vast distances. On the morning of the screening, the sun painted the sky pink and gold, and I feared that few people would show up for a Saturday matinee. SIFF attracts devoted cinephiles, but in Seattle, a rain-free January weekend must be taken seriously. There was standing room only in the theater, however; the shorts had a large and very appreciative audience. Of the three student works by Sámi filmmaker Marja Bål Nango, Halvt ditt og halvt datt (Half of This, Half of That) initially concerned me for its apparent equivalency (using a split screen) of a Sami gakti with a Norwegian bunad, both of which Nango is shown putting on and taking off. I wanted to protest: they aren’t the same! (e.g., the gakti is everyday wear while the bunad is a costume, for special occasions). Nango no doubt intended to provoke that response, as she deftly segués to more complex issues of self-identity. With a stark white background and tight focus on their youthful faces, she interviews several peers about self-identity, and you can watch their emotions shift as they struggle for words. It is powerfully intimate. While it features Norwegian citizens, the film has universal scope; asking if language is essential to identity and what it means to be “half of this, half of that” or “part” anything. I found myself thinking several times of the exhibit about race at the Pacific Science Center. This short would make an excellent addition to it. Nango’s second film, Juletrollet (The Christmas Troll), depicts a Sàmi girl envious of her Norwegian playmate’s Christmas tree. The playmate is curious about Sàmi customs, but whether her questions are benign or condescending isn’t clear. Verging on melodrama, the story is redeemed by a final scene in which the friends perch outside in the dark, singing to the stars. Nango’s characters finds serenity in a holiday that promises more than it delivers. After the screening, several audience members approached with questions about the Sàmi, the shorts, and the searvi. As there was no time for a Q&A session (the theater needed to be cleared for the next film), I promised to write this post and include links as well notes from my phone conversation with Tundra Cowboy’s producer and director, Marc Winkler. If I am able to chat with Marja Bål Nango, I’ll post again. Marc is a Canadian journalist for CBC who lives in Yellowknife, N.W.T. with his wife and two daughters. Tundra Cowboy is his first documentary. Prior to meeting Henrik Seva in Inuvik in 2002, he had never heard of the Sàmi. What inspired you to make the movie? My fascination with living in isolation like that, and knowing Henrik. He seemed like such a grounded person and I thought it might have something to do with having so much time for his thoughts. I wanted to talk to him about that. Although he uses a lot of technology, his pace, his everyday life is very different. Do you think his groundedness is due to that? Slightly. He does have a lot of time to mull over things, and time to explore his relationship with his reindeer. That is what he loves, caring for reindeer; I found that connection fascinating. He sings to the reindeer — and there are all these Sami traditions (connected to herding). The fact that he would travel all the way to Canada to maintain that connection . . . that says something! His grandfather, a herder, is his hero. He found a way to recreate his grandfather’s connection to reindeer. Sometimes he wants to see people and he does go to the town every 10 days for “R & R.” He was recently married, since the filming. He’s not a hermit! How was it to film there? It was really cold, minus 40 outside, with huge winds all the time. The camera batteries kept freezing. But it was beautiful! The tundra is a magical place and so peaceful. Henrik was patient with us, although he was busy herding. We were glad he took so much time. Did he joik for you? Yes, it was a very important thing for him to do. He was pretty shy about it, but he gave us the little example in the movie. For me it illustrates the beautiful connection he has with the reindeer. It is a love song, and it has the practical benefit of making the reindeer used to his voice. What was left on the cutting room floor that you wish you could have included? So much! The film was as long as an hour, and I got it down to 18 minutes. I wanted it to be subtle and focused. There are so many other elements that I tried to puzzle in there, such as the way colonization affected the Sami culture. Like the residential schools here (in Canada), there were government schools in northern Sweden. Henrik was sent to one, and he was punished for speaking Sami. He was not allowed to eat the food he was accustomed to. Reindeer herders were looked own on. He underwent ten years of assimilation, and it was a struggle for him; he felt divided over who he was and whether his culture was worthy or not. It is such a worthwhile project to explore . . . but that is another movie. Also, the whole land and environment issues in Northern Sweden, the forestry and mining projects that are pushing herding into smaller and smaller places. If things keep going like this, it will not be a viable livelihood. In the 1920’s, the government was going to take away their rights to hunt, fish, and herd. Henrik’s grandfather made a deal with the king that they would herd but not fish and hunt. Others could fish and hunt, but not herd. So not all Sami are treated equally. I just had a new daughter so I’m taking a break right now, but some any ideas have come up from doing this. Many different ideas, but nothing solid yet. Marc and I talked a while longer about the Sàmi and the environmental issues that threaten reindeer herding — forestry, mining, and mineral extraction. I hope his success with this first documentary inspires many more. I’m taking a fascinating free, online class through the University of Toronto called Aboriginal Worldviews and Education. One of our first assignments was to write about a “meaningful place.” It was hard to settle on one, as there are so many within shouting distance, but I decided to write about a remote stone labyrinth where (in which?) I have walked in contemplation and more recently, in grief. The labyrinth is located on an island north of Seattle, a place that I came to know through two friends who lived there, a married couple who became, over the years, like surrogate parents (he shared my Finnish and Sámi heritage, she my passion for books and lost causes). Last year they passed away within a few months of each other, and were buried in the cemetery near the labyrinth, behind a storybook white-steepled church. When I visit, I park my bike near the church and walk through the woods to the labyrinth under a canopy of Douglas fir and maple trees. In the distance there is the sound of the surf, and rain or shine, you can smell the salty air. It’s a beautiful place. 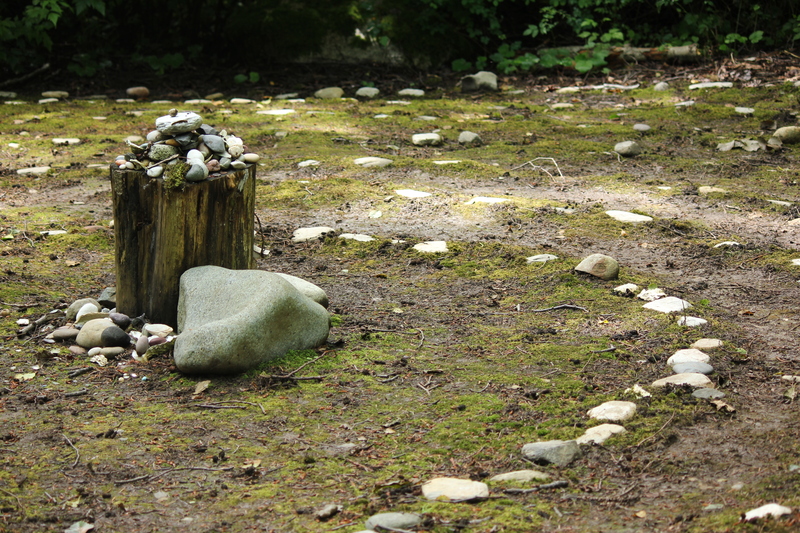 The tradition I learned on the island was to bring a pebble to leave in the middle of the labyrinth. For the bereaved, or at least for me, this is a helpful ritual of laying down one’s burden of grief before returning to the everyday. Unlike a maze, the circles of a labyrinth contain only one path, with no dead ends. The way in is the way out, and the simple act of concentrating on your next step is calming. I prefer to walk alone, although walking with others requires you to synchronize your pace, so that no one is lingering or rushing, and that too is meditative. From left to right: Kjirsten Winters, Lynn Gleason, Sara Linde, Ivan Winters, Julie Whitehorn, Maia Whitehorn, Kai Johnson, Renee Timmer, Espen Storfjell, Troy Storfjell. Photo by James Winters. 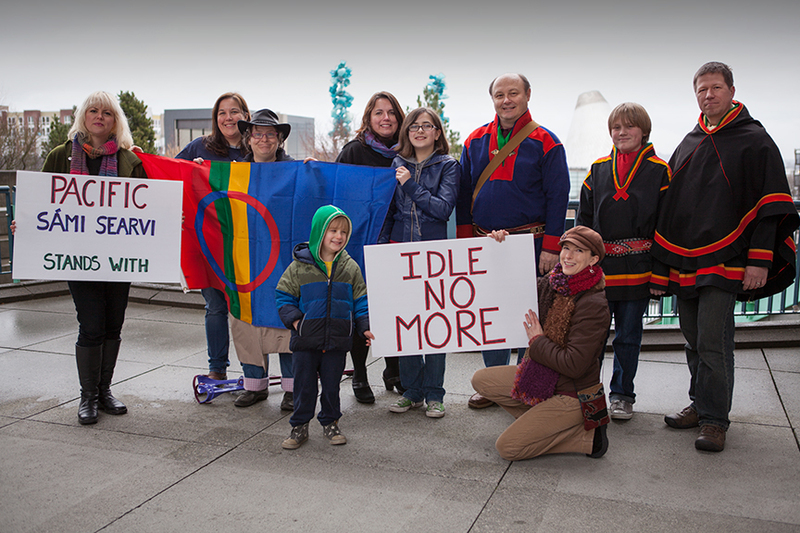 We, the members of Pacific Sámi Searvi (Sámi Americans in the Pacific Northwest) stand together with our Sámi brothers and sisters in solidarity with the Idle No More movement. Within three hours, the photo was “liked” over 900 times and shared over 200 times. Wow. Among the Facebook comments was a not-unexpected question: What is a Sami? Indigenous and non-indigenous people around the world are uniting to support the goals of Idle No More. The Sámi Parliament issued a statement of support on January 11th, as reported here earlier, joining a river of other voices. Why the surge of international support? Many are familiar with Norse myth elements in J.R.R. Tolkien’s “Lord of the Rings” series. 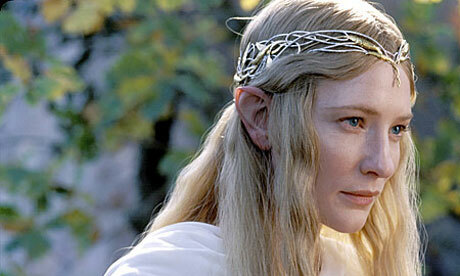 “The Hobbit,” the most recent in the film series, is now in theaters, and as with the other LOTR films, features Elvish, a language created by Tolkien, who was an accomplished linguist in addition to being an author. My friend Kari Turi, who is of Sàmi heritage and happens to speak both Finnish and Welsh, was astounded when, on viewing the films, he understood the Elvish. What a thrill that must have been! Have you seen the movies or read the books? Do you know of other Sàmi connections? Recently I was asked to create a small exhibit at the Swedish Cultural Center to illustrate the ancient origins of Scandinavian Christmas traditions. Below are the tidbits I pulled together (only a few of which made it into the display). The objects in the display, owned by the Center, include beautiful weavings and Yule decorations such as a Julbok, a cheese press marked with an “x” to keep away evil, and a Christmas porridge bowl. Update: There is a fascinating account of Christmas traditions in Sàpmi here, and an exploration along of pagan Yule traditions from a Norwegian perspective here. Are any of these surprising to you? Do you have any corrections or additions? Please let me know in the comments. For the church’s first three centuries, Christmas wasn’t in December—or on the calendar at all. December 25th already hosted two other festivals: natalis solis invicti (the Roman “birth of the unconquered sun”), and the birthday of Mithras, the “Sun of Righteousness.” The winter solstice, another celebration of the sun, fell within a few days. Roman church leaders decided to take advantage of the popularity of this season when they chose the date to celebrate Christ’s birth, an event that probably occurred in the month of September.